Handcrafted by the Amish, this radiant Deluxe Jewelry Armoire features gorgeous raised panels and ornate rope twist designs that offer a modern take on the classic Early American style. Featuring seven full-extension felt-lined, dove-tailed drawers and two side necklace cabinets, you can be sure you'll have all the room you need for all of your precious jewelry and keepsakes. 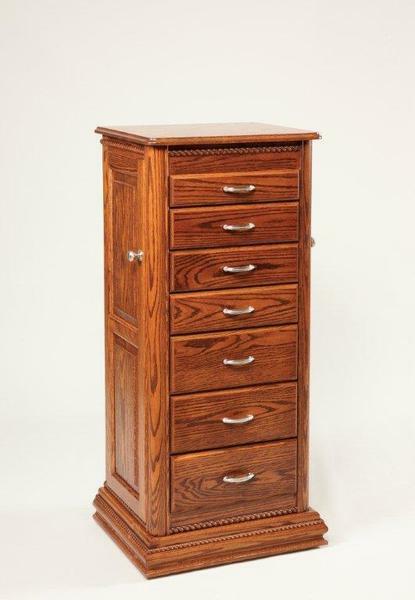 Choose to have this jewelry armoire handcrafted just for you in Cherry, Oak or Brown Maple Wood and choose the perfect finish to fit your decor. This hardwood armoire comes standard with a finished back, dovetailed drawers and solid wood construction, so you can be sure to have a piece that can be handed down and enjoyed for many generations to come. Hi Gwen, I wanted to let you know everything arrived and it looks wonderful. My compliments to the woodworker, he did an excellent job. Thanks again.